Book Review of Jodi Picoult's new book "Small Great Things"
I was given this book for advance reading by Net Galley, many thanks to them for letting me read this book. 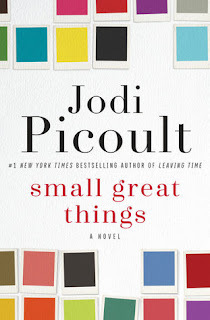 I have read almost all of Jodi Picoult's books and have always admired how she can give both side of the story, in fact that is one of the main reasons I enjoy her books to begin with. I know that she will be giving me something to think about! This book is no exception. The story has stayed with me now for several days and has given me more to contemplate than any of her other books. I believe this book will be responsible for changing my ideas on the matter of racism and has opened my eyes to many things I didn't realize or care to think about before. It takes a talented writer to get readers to reconsider their ideals, in this lies Jodi Picoult's greatest talent. Thanks Jodi! 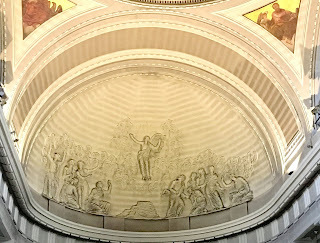 Since today is the Feast of the Ascension (celebrated on Sunday) I thought I would share a photo of the ceiling of the church of St. Theresa in Dublin, Ireland...such a beautiful church! I could do another trip to Ireland and just do a tour of all the churches they have. I haven't been here for a while! I think I originally created this blog for book reviews and I haven't kept up with it Obviously! Funny thing is, I come back after all this time to tell you about a couple books I have read! The first one was a recommended book from Reese Witherspoon's book club called, In a Dark, Dark Wood by Ruth Ware. This one looked good to me because she said it was scary, however, it wasn't scary, not to me anyway. I mean really, has she read Stephen King? The book did keep my interest and it was an easy read, two things I look for in summer books. Through most of the book though, I kept getting the feeling that I have read it before or at least something quite like it. 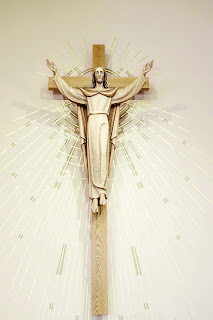 Jesus is the ONLY King!